“A Garfield Christmas”: Garfield, Jon, and Odie go to Jon's grandmother's house for Christmas, where Garfield finds a present for Grandma. “A Garfield Thanksgiving”: Finds Jon with a love interest-- a veterinarian who orders Garfield on a diet--and then comes for Thanksgiving dinner! “Garfield Halloween Adventure”: Finds the portly hero and airhead-sidekick Odie the dog scrounging through owner Jon's attic to find perfect costumes, then encountering ghosts and ghoulies that seem a tad authentic. “Garfield on the Town”: Garfield escapes from the car on a trip to the vet and finds the place where he grew up. “Garfield in Paradise”: The Garfield gang is in Hawaii with a 1957 Chevy. 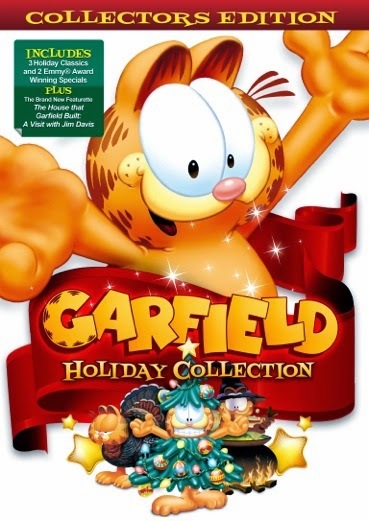 GARFIELD HOLIDAY COLLECTION also includes the brand new featurette THE HOUSE THAT GARFIELD BUILT – A VISIT WITH JIM DAVIS.